To visitors, architectural ruins are simply a modern reality, and their imagined reconstruction is left to descriptive plaques, statics images and the human imagination, but this series of renderings dynamically recreates each of seven different famous sites, brick by brick and column by column. The collection includes the Temple of Luxor in Egypt, The Temple of Jupiter in Pompeii, Hadrian’s Wall in England, the Temple of Largo Argentina in Rome, Italy, the Parthenon in Athens, Greece, as well as the Pyramid of the Sun and the Nohoch Mul Pyramid in Mexico. In some cases, there is barely anything left to extrapolate from, but by outlining, framing and filling in each structure, the relationship of what remains and what once was can be seen side-by-side. Also highlighted is the order of decay, showing which materials and structural components were most durable and which ones were subjected to decay and destruction. Of course, they could be physically restored as well, but questions of archeological ethics and historical truth make this a difficult proposition — and there is something to be said for the aesthetic of a ruin, particularly those that have shaped modern architecture. Take the bleached-white columns of ancient Roman and Greek cathedrals — these informed an entire area of Neo-Classical and Greek Revival design, but it is based on the ruins having lost their color over time. In reality, the buildings on which these styles are based were once highly decorated, so it was the ruined versions, not the originals, that inspired places like American capital buildings of today. Neomam created this series for Expedia. The creative contractors behind the labor-intensive renderings are Maja Wroska and her husband Przemek Sobiecki, who works as This Is Render. A great potential next-level application for this strategy would also be to add in an augmented reality component, allowing visitors to use their mobile devices to see these reconstructions overlaid on actual ruins in realtime. 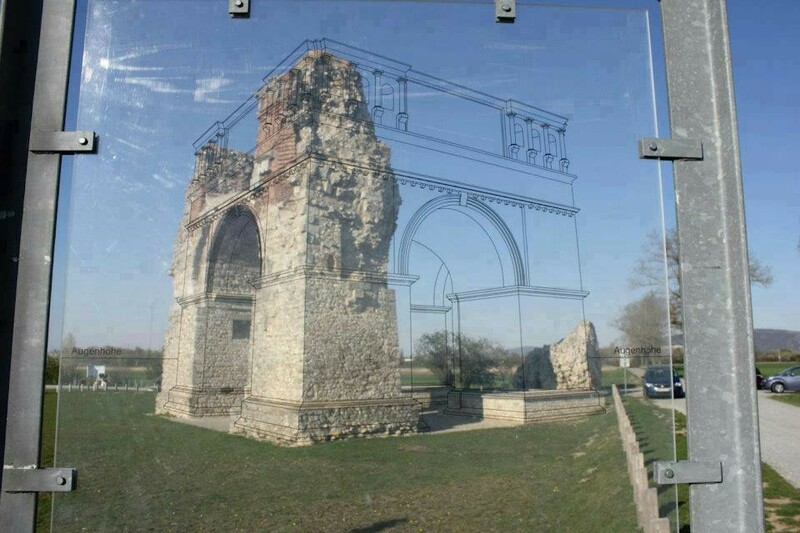 Along those lines: a pane of glass overlaid with a simple line drawing brings crumbling ruins to life at one of Austria’s most famous historical sites, reanimating the partial building near the Open Air Museum Petronell. When a viewer lines up the illustration with the structure, known as Heidentor (Heathen’s Gate), the image completes itself in a compelling yet entirely low-tech fashion.